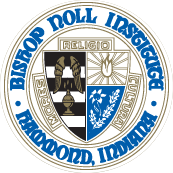 All students attend retreats away from school during each of their years at Bishop Noll. Freshman Retreat: Held at the beginning of the year, the freshman retreat introduces students to each other and begins the faith journey of all BNI students. Throughout the day, a special emphasis is placed on the Catholic mass and what it means for us to participate in it. Sophomore Retreat: El Camino (The Way): “El Camino” is a famous, traditional pilgrimage trail in northern Spain. For over 1000 years, people have walked this road following only a set of yellow arrows painted on rocks, trees, trails, and signs. Without a map, pilgrims reach the great cathedral in Santiago, built on the tomb of St. James. Sophomores will be shown “the way” on this overnight retreat – a simple progression that calls retreatants to reflect on self, others, and God. This helps us gain self-knowledge, strengthen our relationships, and grow closer to God. This was retreat was planned entirely by Bishop Noll’s Student Ministry Team. Junior Retreat: Kairos : Kairos, a Greek word that means, “God’s time,” calls juniors to embrace timelessness in this intensive four-day Catholic retreat. Kairos uses personal talks from peer and adult leaders, small- and large-group discussions, periods of silence and reflection, various integrated prayer experiences, and the Sacraments to invite teens to more seriously discover God in all things. The real value of Kairos occurs in living out the values of the retreat in one’s everyday life, so follow-up “Fourth Day Meetings” occur at school to sustain the impact of the retreat for all Kairos alumni. Senior Retreat: Senior Retreat invites students in their final year of high school to confront, reflect on, and discuss challenging issues in their lives. Through communal activities, witness talks, small-group discussions, and larger forums, seniors will engage with topics like integrity, family and relationships, sexuality, identity, and drugs and alcohol. The retreat challenges them to be the best versions of themselves as they go off to college and grow into adulthood. Each semester as part of the theology classes, students are required to fulfill a certain number of service hours. These hours are part of the formation of each person so that he or she can become more involved in the community and learn what discipleship truly means.